If you find yourself in Ibiza this summer, be sure to check out the current Bill Violainstallation at art collector Lio Malca’s La Nave Salinas. 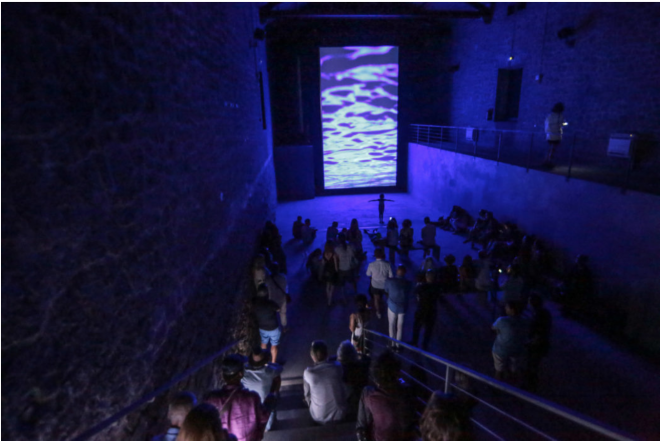 The large-scalle installation features two video and sound projects that are considered to be some of Viola’s most important work: Tristan’s Ascension (The Sound of a Mountain Under a Waterfall) and Fire Woman. Projected onto a 22-foot screen with surround sound, it is an immersive experience that is entirely closed off from the outside world. “Art is, for me, the process of trying to wake up the soul. Because we live in an Industrialized, fast-paced world that prefers that the soul remains asleep,” said Viola. The artist—whose work revolves largely around themes like birth, death, and transformation—uses technology as a tool to explore the human condition. Employing dualities like light and dark, or life and death, Viola creates a space for meditation, contemplation, and even enlightement. Malca transformed La Nave Salinas, originally an old salt warehouse, into an 8,000 square foot exhibition space as a way to share his dedication to arts and culture with the public a few years ago. Viola’s installation is on view through September 30.